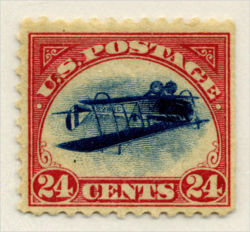 Printed upside-down in error, the Curtiss JN-4 appears on a famous stamp; the stamp is known as the "Inverted Jenny". The Curtiss JN-4 is a series of aircraft built by the Curtiss company of Hammondsport, New York, later the Curtiss Aeroplane and Motor Company. 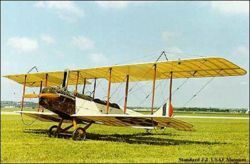 Curtiss combined the best features of the model J and model N trainers, built for the Army and Navy, and began producting the JN or "Jenny" series of aircraft in 1915. Curtiss only built a limited number of the JN-1 and JN-2 biplanes. The JN-2, somewhat deficient in performance, had had equal wing spans with ailerons controlled by a shoulder yoke located in the rear cockpit. The improved JN-3 design incorporated unequal wing spans with ailerons only on the upper wings, which were controlled by a wheel. In addition, a foot bar was added to control the rudder. The 1st Aero Squadron (Signal Corps) began receiving JN-2s in 1915. The Squadron was transferred to Fort Sill Oklahoma in 1916 to work with the Artillery School. Later that year some of the aircraft, both JN-2s and JN-3s, were deployed to Mexico for aerial obervation during the Pancho Villa Expedition of 1916-1917. The Curtiss JN-4 biplane is possibly North America's most famous World War I aircraft. It was widely used during World War I to train beginning pilots, and was known in Canada as the "Canuck", and in the U.S. as the "Jenny". It was a twin-seat (student in front of instructor) dual control biplane. Its "Pulley" front engine and maneuverability made it ideal for initial pilot training with a 90 hp (67 kW) Curtiss OX-5 inline engine giving a top speed of 75 mph (121 km/h) and a service ceiling of 6,500 ft (1980 m). A seaplane version was built for the US Navy which was so modified that it was essentially a different airframe. This was designated the N-9. The final version of the aircraft was the JN-6. In U.S. Army Air Service usage the JN-4's and JN-6s were configured to the JNS ("S" for "standardized") model. The British used the JN-4 for their primary World War I trainer; Canadian Aeroplanes Ltd produced them in Canada. Many Royal Flying Corps pilots earned their wings on the JN-4, both in Ontario and in Texas. Most of the 6,813 built were unarmed, although some had machine guns and bomb racks for advanced training. None saw active service. After World War I, hundreds were sold on the civilian market, one to Charles Lindbergh as his first aircraft. The plane's slow speed and stability made it ideal for stunt flying and aerobatic displays. Some were still flying into the 1930's. This page was last edited on 6 March 2007, at 02:38.